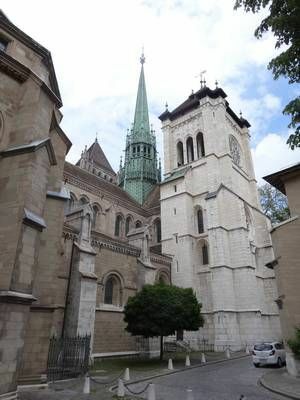 St. Peter's Cathedral (english), or Saint Pierre Cathedral (french) is over 850 years old Geneva's main church, famous for Jan Kalvin preaching here. St. Peter's Cathedral is located in the center of Geneva's Old Town, slightly on the hill overseeing the city, combining various architectural styles from Gothic to Ancient, as it was being rebuilt over the centuries. Since 16th century Cathedral belongs the Reformed Church. North and South Towers are available for visitors vith outstanding views over Geneva. Cathedral also hosts numerous concerts, there is an archaeological site and Maccabean Caple located here and open for the public. St. Peter's Cathedral was build between years 1160 - 1252, on the place where previously used to stand basilica from the 6th century. Cathedral was rebuilded several times, last reconstructions took place in 18th century. In 1397,	the Chapelle des Macchabées was added to the original building and in 1752 the portico was added to the western facade. Interiors of the Cathedral were vastly demolished in 1535, when Geneva's residents accepted the Reformation and destroyed all the altars inside the cathedral, all the statues and most of the paintings in a rage. Luckily the Pulpit and some paintings at the tops of the pillars were preserved. The main building of St. Peter's Cathedral is 64 meters long. It has a old, spacious and rather plain interior, highlighted by shiny candle-like looking chandeliers, with beautiful shrine, several rows of benches and few chapels. Side aisles contains huge stone blocks - tombstones of church dignitaries from 15th and 16th centuries. Cathedral is rented for concerts sometimes. There is no entrance fee for the St. Peter's Cathedral. One huge pipe organ to sound the whole ship is located above the entrance, in a back of the Cathedral. From the front it looks little bit like a huge gold-silver-red crown. Today, several loud speakers are installed on the pillars to provide for better (even though electronic) sound. Another smaller organ is at the front left side. Last entry to the tower half an hour before cathedral's closing time. Climb up the two tall towers with long spiral staircase to get an ultimate 360° view on the whole Geneva and Geneva lake with it's monumental Jet d'Eau. The two towers are the North and South tower and if You feel like visiting both towers is too much of a climb, visit South tower in the good weather, as it has an open air balcony where you can walk freely, with direct view ower the lake, while North tower's top room is a spacious wooden room with closed windows, thus is preferred in a rainy weather. During the concert in Cathedral (mostly summer), entry to towers is closed. Entrance for the towers is CHF 5 for adults and CHF 2 for children (6-16). Buy the tickes from the reception inside the cathedral at the end on the left (where there is also shop with postcards and Geneva's guides), or get free ticket with Geneva Pass. Entrance to the first tower (North) is located opposite the reception, near by. Towers are connected by a corridor at half height of the towers, where You can see whole Cathedral's rooftop, with it's original stone walls and heavy wooden plates. This maze of staircases and narrow routes connects one tower to another one, making it easy to visit both towers without having to walk all the way down. St. Pierre Cathedral is famous for being a place where Jan Kalvin was staying and worked. You can see the triangular stool, where he reportedly used to sit, just next to the Pulpit. In South-West corner of the cathedral is appended Chapel of the Maccabee (the last chapel on the left) with beautiful Gothic paintings. It was originally used as a storehouse and later as a schoolroom. Only in 1878 it was remade into the Maccabean chapel and the Gothic decoration was added to it. On the place of cathedral were recently found remains of basilica that was standing here previously, and mosaic paintings, walls, rooms and flooring from the buildings even several centuries older (dating back to the 4th century). All these historical findings are proving the existence of the city in the antiquity. There is a little museum made on the place of the Archaeological Site open for the public. You can see the artifacts and rooms found here, such as: The Roman Crypt, Monk's Cells, The Allobrogian Tomb and several AudioShows portraying the history. Entrance: CHF 8 for adults, CHF 4 for students and children, free with Geneva Pass. Opening hours: daily 10am to 5pm (last entrance at 4:30pm). Small shop is located in the left-back corner of the cathedral sell little souvenirs; Geneva city guides in English, French, Spanish, German, Italian and Russian language; variety of postcard about Geneva, Jet d'Eau, Zermatt mountain, Jean Kalvin and Church. Here you can buy a ticket to Towers. Open during Cathedral's opening hours. On the north side of the St. Pierre Cathedral, just next to it, is the Musée International de la Réforme, or International Museum of Reformation, Geneva, portraying the reformation times, ideas, lives of the common people and discussing about the theology and history. 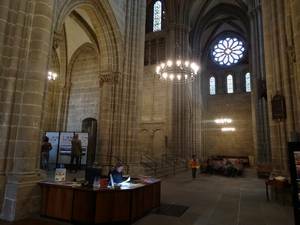 5 min walk (500 meters) south-east from the Cathedral, at Rue Charles-Galland 2, is huge and comprehensive Museum of Art and History, which hosts most of the significant historical artifacts from this Cathedral, it's Archeological Site and some of it's glass painted windows. One of the artifact originally painted for the Cathedral and now displayed in Museum of Art and History is St. Peter Alterpiece, painted by Konrad Witz in 1444. Every full hour the big clock on the tower struck the time, followed by the play of glockenspiel - most common is the song of Swiss Nathional Anthem.